The movie is based on the King Arthur story starring Charlie Hunnam as Arthur. Kamil Lemieszewski as Merlin, Astrid Berges-Frisbey as Guinevere, Dijmon Honsou as Sir Bedivere, Eric Bana as Uther Pendragon, and Jude Law as Vortigern. IMDB Storyline: The young Arthur runs the back passages of Londonium with his crew, not knowing his royal lineage until he grabs Excalibur. Instantly confronted by the sword's influence, Arthur is forced to make up his mind. He joins the rebellion and meets a shadowy young woman named Guinevere, he must learn to understand the magic weapon, deal with his demons, and unite the people to defeat the dictator Vortigern, the man who murdered his parents and stole his crown to become king. The movie appears to take some leeway with the King Arthur storyline and there does not appear to be a Lancelot or Morgan Le Fey. Those two characters add a lot of story so I am sure the writers wanted to keep from having the viewers get lost in too much storyline. It is slated for release on May 12th, 2017 with an estimated budget of $102,000,000. 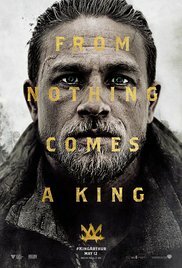 If you factor in the star power and Guy Ritchie as the director, the movie should be able to make its money back plus who doesn’t enjoy the King Arthur tale especially starring Hunnam. As long as he does not end up being Jax Teller with a sword.